Fall has officially started, leaves are changing colors and the temperature is cooling down. The holiday season is coming up signaling Halloween, Thanksgiving, and Christmas, our favorite time of the year! We’ve come up with some exciting new designs to decorate every part of your home for the season and to give your best gifts yet! The holiday season always revolves around the kitchen, traditional recipes and sharing meals as a family. The kitchen is one of the most important parts of the home in every culture! A personalized cutting board is great for serving the perfect autumn appetizer. Adorned with a sweet pumpkin and fall leaves, this cutting board is sure to impress! Making it the perfect gift for the party enthusiast, who is sure to use it throughout the season and for years to come. Entertain your guests by using our monogrammed wreath wine glasses for a stylish toast! Match the wine glasses to the monogrammed wreath hand towel to really pull the room together! 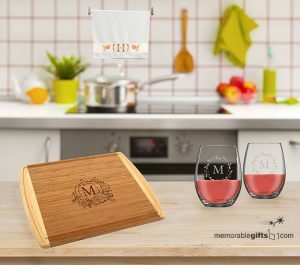 Purchase a set and give as the perfect gift for a fall wedding or for the host of thanksgiving dinner. Snuggle up to the fire with a warm blanket and a cup of hot chocolate on a cool autumn night with your monogrammed fall mug. Perfect gift to keep your loved ones warm during those cool fall mornings and evenings. The Den is the second most important room in the home! Nights spent around the fire with your loved ones, telling stories, playing games and making memories. Decorate the mantle with these charming tealight candle holders, a monogrammed wreath and the sweet autumn pumpkin design really bring light and warmth to a room. Add scented candles like pumpkin spice and cinnamon to really make the room feel like autumn! Welcome the fall season in with a rustic framed wall panel, making the perfect gift for new home owners! 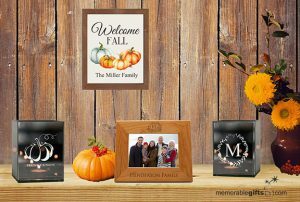 Add a personalized fall photo frame to really pull the family room together and make it feel like home! As the cooler weather rolls around make the start of this holiday season extra special with these autumn decor tips. Spread the love and warmth of this fall season with these special gift ideas that friends and family are sure to love! How do you plan to celebrate the start of fall – Any decor tips and tricks?